LOR Software, DavidAVD Usb485 Adaptor & CTB16PC HELP NEEDED!!!! Discussion in 'LOR General Discussion' started by Brettus, Oct 10, 2012. I really need some help with getting my controllers working. Here is what I have. DavidAVD Usb Adaptor, LOR to Esta Adaptor, 1 x CTB16PC V1(bought off ebay recently) and CTB16PCg3 (bought Brand new). Here is my problem, I downloaded the demo of LOR software from there website and installed it on my PC, but i can not get the problem to detect the controllers. Now i now i have the cables hooked up correctly because i can get the CTB16PCg3 to talk to Vixen, but the problem is I need to update and set the CTB16PC V1 to controller 2. For me to update and configure the controller do I need a full version of the software so that i can use the USB adaptor that I have or do I have what i need to do the job??? If i do have everything how do i configure LOR to talk to the controller so i can reconfigure it. I was in the same situation as you, I had bought a LOR controller (used) and needed to set it up. My reasearch led me to find out that the free version of the software does not talk to the controllers so you cannot set them up with it. I am not sure about the dongle and other kit you have. I ended up purchasing a LOR adapter to get mine working. Maybe there is another member that lives near to you who wouldn't mind setting your controls up for you. It would save you the expense of the software package. LOR software won't control any lights in demo mode. You'll need to buy at least the Basic version to use in LOR mode or the Advanced version to use in DMX mode. If I buy the basic program, with your adaptor, can I update the firmware on the older controller and change the id??? I've not tried it, but as far as I know my USB485RJ-ISO behaves the same as the LOR non-isolated dongle in functionality. So in a nutshell, I'd think it should work. Not sure if I missed something(DMX? ), and my 240V controllers were v2(not v1), but the LOR hardware utility seemed to work fine and allowed me to at least test lights, scan for controllers, etc. Are you working with a single controller at a time conected? the hardware utility worked for you with the free version of S3? 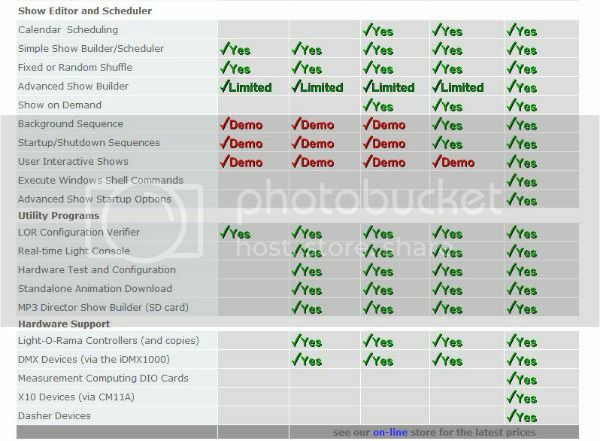 LOR software page shows no hardware test and configuration in the demo package. Pretty sure I had it working on demo before I registered. Figured they'd want you to see how easy things were, make sure it was all working before you registered(teaser if you like). THis is quite annoying, bought the licence and connectted it all up. When i have the hardware manager up, i manual set it to com 3 which is what it is configured to in device manager, when i hit refresh it runs through the network search and comes back with no devices found. Whats weird is the control acts like it is suppose to, the light on the controller stays solid. Pretty sure you need the lor USB dongle to change address settings of the controllers. How many controllers do you have connected? Best to test if only one controller is connected at a time. Does it do this with both(you have two?) controllers? Is it possible that the controller has an ID set outside the range that you are scanning?